Nylon coating without racking� the Maxicoat® method leaves no rack marks for a completely coated part! Collt's Maxicoat® process has succeeded when other coating methods have failed. 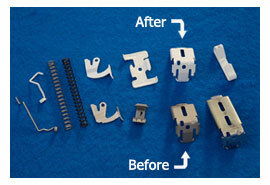 Traditional methods of coating small metal parts leave unattractive ”voids” in the coating. These ”voids” also allow corrosive elements to shorten the life of the product and create uneven coating thickness which can affect product specification. The Maxicoat® process eliminates these ”voids” and coats your product with a smooth, consistent coating. A part that is within an 8” x 4” area and is a maximum weight of 7 to 11 ounces is ideal for Maxicoat®ing. Maxicoat® provides a solution for high volume parts at low and competitive prices!